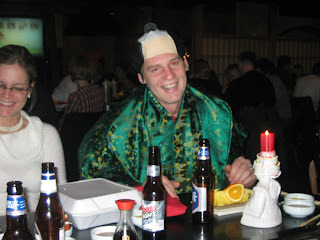 And then because Nate and Dar were Shogun rookies, we made Nate celebrate his belated birthday Japanese style! I'm starting to wrap up getting the quilt squares and I'm getting really excited to see how this thing is going to turn out. 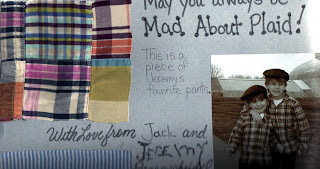 Prepare yourself for the following quilt squares from my friend Tammy. She gave them to me all nicely presented on scrapbook paper, but unfortunately the top of this first one got cut off when I scanned it, but it says: "May you always be Mad About Plaid!" 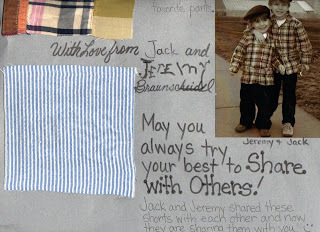 And how cute are her boys - Jack and Jeremy? How amazing are those?! Thanks Tammy!! I can't wait to see the finished product! Joanie has her work cut out for her! Tee-hee, catch the pun? 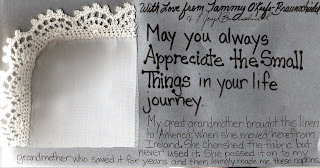 Wow, great fabric and great wishes. This is going to be a fantastic quilt. 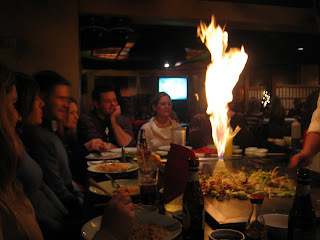 Sorry we missed out on Shogun, but I'm holding out for the Melting Pot!